Although the Law Library will be open Tuesday, August. 26, the Reference Office will be closed. The Reference Office will re-open at 9am on Wednesday, August 27. And one more reminder, in observance of the Labor Day holiday, the Law Library and Reference Office will be closed Friday, August. 29 through Monday, September 1st. Congressional Republican leaders asked the Government Accountability Office to review the Department of Defense's actions in releasing five prisoners from Guantanamo to Qatar in exchange for the Taliban releasing Sgt. Bowe Bergdahl. A lot of countries have constitutional provisions establishing a right to a clean and healthy environment. Which ones? And what language do they use? A political science and public policy professor has put together information from several sources to create Envirorights Map, an interactive page that answers these questions. the Constitution of Kenya (2010) with a link for more. 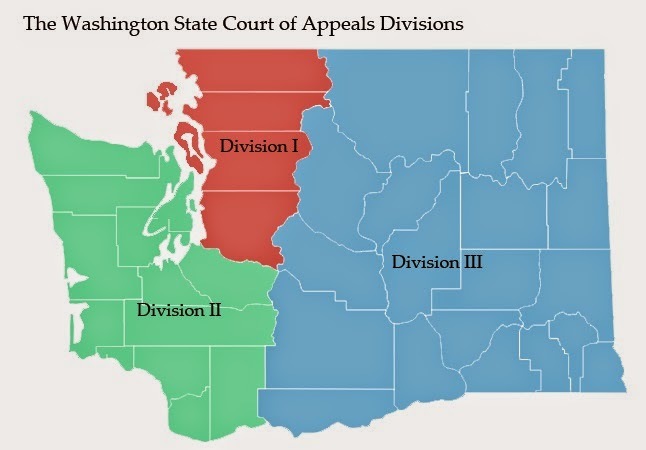 Unlike the federal circuits, the Washington Court of Appeals is a "unitary system"—one court that sits in three divisions, not three separate courts. But sometimes panels from two divisions disagree with each other, so there can be conflicting precedent. What's a trial judge to do? And how should counsel frame their arguments to the trial court? Learn more about the problem and possible solutions in: Mark DeForrest, In the Groove or in a Rut? Resolving Conflicts Between the Divisions of the Washington State Court of Appeals at the Trial Court Level, 48 Gonz. L. Rev. 431 (2013). When School of Law summer quarter exams end this Friday, August 8th, the Law Library and the Reference Office will begin interim hours of operation. The Library will be open weekdays, Monday through Friday, 8am - 5pm. The Reference Office will be open weekdays, 9am - 12noon and 1 - 5pm. The Library and the Reference Office will be closed on Saturdays and Sundays. In addition, the Library and Reference Office will be closed on Monday, August 11th, and from Friday through Monday, August 29th through September 1st, for Labor Day. These hours will be continue from Saturday, August 9th, through Sunday, September 21st. Reference librarians will respond to questions submitted through the Ask Us link on the Law Library website when the Reference Office is open.